This past Friday, Oct. 9, Rebuilding Together New Orleans completed the rebuilding of its 500th home since Hurricane Katrina. Through RTNO, over 500 volunteers worked on 14 home repair projects for disabled, elderly and military veteran homeowners over the first two weekends of October. During the first two weekends of October, over 500 volunteers from 32 local teams will work on 14 home repair projects for low-income homeowners through Rebuilding Together New Orleans’ 25th annual October Build presented by Chevron. This year, volunteers will be assisting 17 elderly or disabled homeowners, including five military veteran homeowners. 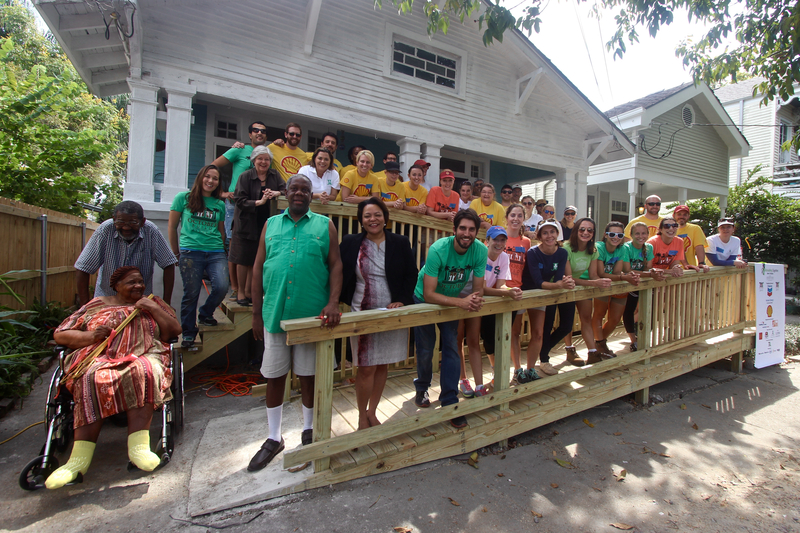 Since 1988, October Build teams have completed over 1084 projects in 35 neighborhoods across the city and this community revitalization event has turned into a long-standing tradition for many local groups including Junior League of New Orleans, Chevron and Shell New Orleans who have participated since the beginning. During October Build, volunteers will be making critical repairs to provide elderly, disabled or veteran homeowners with safer and more energy-efficient homes. 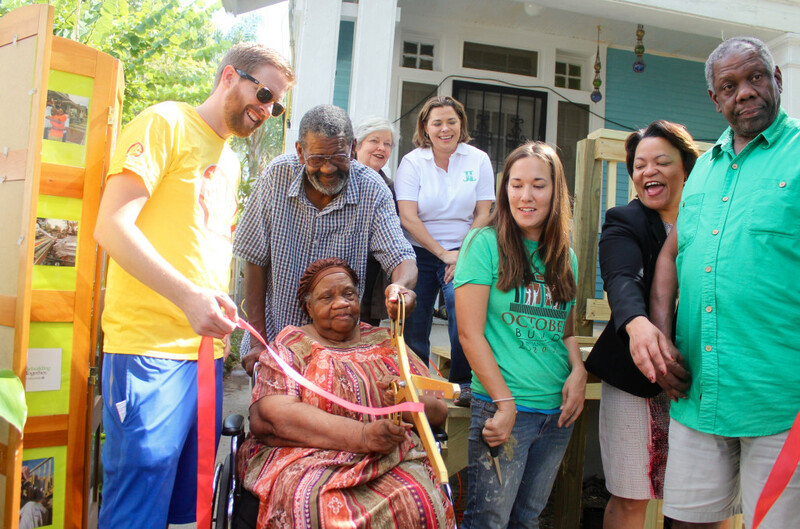 From installing safe handrails and steps to wheelchair ramps, volunteers will make a lasting impact on homeowners who do not have the physical or financial ability to make critical repairs, which will keep them safe and save them money on utility bills. A program of Preservation Resource Center of New Orleans (PRC), Rebuilding Together New Orleans started in 1988 when the PRC instituted a one-day neighborhood revitalization pilot program in the Lower Garden District. The pilot program was named “Christmas in October” and was implemented to address the needs of existing homeowners, namely the elderly and disabled who had become ill equipped to manage home repair. After Hurricane Katrina, Rebuilding Together New Orleans modified its mission to aid those displaced by Hurricane Katrina. This year not is not only the 25th anniversary of October Build, but it also will mark the 500th completed project since the storm. For more information about Rebuilding Together New Orleans or October Build, visit www.rtno.org. Connect with Rebuilding Together New Orleans by visiting www.facebook.com/RebuildingTogetherNewOrleans and on Twitter: @RT_NewOrleans. Wonder how much Shell paid to be in the photo op for the 500th house? Don’t think for a moment it was coincidence. Did you really just criticize volunteers who built a wheelchair ramp for someone? Stay classy, Craig. Practice better reading comprehension. I criticized Shell’s PR team for manufacturing the photo op. Just as I would criticize Mitch for appearing out of the gloom and posing for a photo op before disappearing again. I left a more in depth response below. Stay informed, rooster. They probably paid for all the materials, time for their employees to attend and volunteer, etc. It is a charity- it is all paid for by someone more fortunate. Very sinister indeed. Also, why does Chevron get a pass in your critique? 1) Chevron isn’t prominently pictured, is it? 2) I have personal experience with Shell’s PR. Also, I never said or implied anything about this being “sinister” but if you want to beat up on a straw man, have it. I’m guessing you don’t have any knowledge of what these corporate “volunteer” events are Iike. For the individuals involved, it is first and foremost a “team building event.” Not that there’s anything wrong with that but it makes posing in front of the finished project that many others worked on disingenuous. For the company, this is about extracting the max amount of PR for the smallest paltry sum they can get by with donating (tax deductible of course). The individuals are *compelled* by the company to wear those obnoxious shirts with the giant logo on it; official explanation is that you could be in the office but you’re here so Shell “bought and paid for you.” Guess what happens if an employee volunteers on his day off and doesn’t want to wear the logo shirt? PR (which is on hand for all of these events) steps in and says it’s not an option. Enforce the corporate brand or take a hike. Because giving to the community is NOT at the top of the priority list (or #2 for that matter). Moving past all that, here’s how a typical volunteer Shell day goes: Wait for people to assemble while everyone socializes, til 9 or 9:30 if you have to, don’t want anyone to miss the fun that comes next! Then take up to 30 minutes for a “safety meeting.” Not knocking on safety, it is important, but there’s an 11 page Job Safety Analysis (yes, they have a name and acronym for that) that individual teams painstakingly go through, discussing outcomes and mitigations for some really ridiculous and unlikely events as if they’re operating in a high risk, explosive environment like an offshore oil rig. Employees are encouraged to speak up and contribute even if you’re making up nonsense as long as it *sounds* like you care about safety. The whole exercise could be done in 50 seconds but this day isn’t REALLY about getting work done. Then maybe you get 2 hours of light work in before lunch. Mind you, there will be about twice as many hands as you need for the simple tasks that are given and Shell employees are generally prohibited from using any power tools because the company is more concerned with legal LIABILITY than getting a job done here. So the effort to achieve anything is severely handicapped. Then there’s an hour for lunch and more chit chat. Lately, there’s an additional unproductive 30 minute meeting after lunch that they call a LEAN exercise where employees discuss ways to improve the volunteer effort’s efficiency (isn’t that ironic). Again, employees are on the spot to say *something* even if they’re just wasting oxygen. All the employees looking to get in a boss’s good grace do this. So the exercise drags out much longer than it should. Finally work stops around 2:30. So maybe 4-5 hours are spent actually working during a ‘volunteer day’ and don’t forget to factor in the redundant/idle hands. If there’s any other smart aleck comments you’d like to make for me to destroy with simple facts, just lemme know.